Ever wondered why it is so hard and expensive to build and deploy connected products and IoT solutions based on cellular connectivity? And how it can be done better? Learn from Electric Imp CEO Hugo Fiennes — the guy who built the iPhone at Apple and architected the first Nest thermostat — about how Electric Imp reinvented cellular IoT. Lots of exciting developments lately. Please check our new Microsoft announcements, including advanced AMQP support, Azure IoT Hub integration, and fully integrated ‘All-Azure’ offering with private cloud. Headed to IoT World 2017 Santa Clara next week? Check out the Electric Imp booth … lots to see, people to meet, answers to get. Electric Imp will be participating at Hannover Messe next week, as part of the Industrial Internet Consortium (IIC) pavilion and Industrie 4.0 – IIC security demonstration. If you are in Hannover, please visit us in Hall 8, Stand C24 (IIC Pavilion), Booth 13. Or schedule a briefing with us. Electric Imp is excited to announce our new impWorks Developer Tools Release 1. In this first release, impWorks includes the Builder Preprocessor and the Sublime Text Editor Plugin, which combine to boost the efficiency, control, and workflow of the software development process. Read all about it here and try it out today. Electric Imp has a big EmbeddedWorld 2017 presence at four partner booths: Arrow, ST Microelectronics, Cypress, and Murata. For more information, see our blog. This is a webinar in the IIC (Industrial Internet Consortium) webinar series. A key challenge in getting IoT projects off the ground is evaluating technologies, architectures, and concepts – you need to be able to easily build a proof-of-concept and evaluate a platform and design in terms of security, hardware capabilities, integrations, and other key requirements you have … often with limited engineering budget and on a short time frame. Typically, these evaluations take weeks or even months and involve significant custom hardware and software design just to even get to a prototype. And once you’ve validated the prototype you often have to throw that away and start over to develop a production-grade design. This approach incurs a lot of cost, risk, and delay in getting to market with a robust and complete IoT solution. The Electric Imp platform is designed from the start to be pre-integrated, secure, production-ready, and easily adaptable – allowing you to go from evaluation to production with minimal engineering effort, short time, and high confidence. To accelerate this process even further, Electric Imp is today announcing the QuickStart Family of impAccelerator Solution Kits, which are off-the-shelf hardware platforms that you can use to kick-start your prototyping and evaluation. impAccelerator Solution Kits allow you to plug-and-play different hardware and software components and assemble and evaluate production-grade end-to-end IoT solutions in record time. 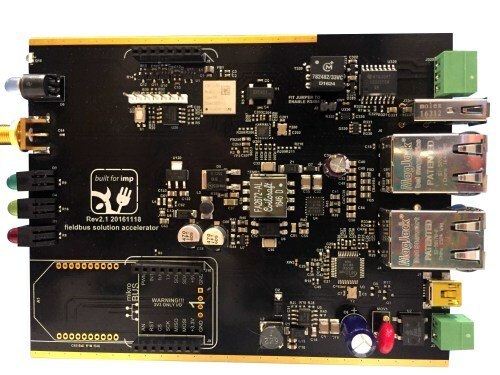 The ZigBee Alliance recently issued a Statement on Security, prompted by the widely reported attack “IoT Goes Nuclear: Creating a ZigBee Chain Reaction”. While this attack may not be based on a weakness of the ZigBee standards it does highlight a key weakness in the way most IoT deployments are architected today, which is by integrating a number of disjunct technology components and services from different suppliers and then facing the challenge of maintaining security of the combined result for years to come. This approach has a high risk of mistakes, resulting in unproven designs, integration gaps, or weak links, and makes it very difficult to rapidly address security vulnerabilities because fixes need to percolate through the entire integration chain before becoming effective. By that time, the damage is often done. We at Electric Imp believe the problem needs to be addressed with a very different approach: By offering a fully integrated and tested silicon-to-cloud security architecture with ongoing platform and security maintenance. Security not only at deployment, but over the lifetime of the solution. Defense-in-Depth and Defense-over-Time. It’s how IoT Security needs to be done. Yesterday, the Z-Wave Alliance also made an announcement for plans to beef up security. This highlights the challenge of retrofitting existing deployed devices and the moving target security presents.